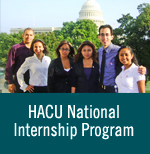 The Hispanic Association of College and Universities will offer a two webinars to provide information about “Gaining career experience with a HACU paid internship.” A webinar offering tips for submitting an application will discuss “Navigating the HACU Online Application.” Students interested in securing a paid internship in the summer or fall of 2019 are encouraged to participate in these two free webinars. January 16, 2019, 3:00 – 4:00 p.m. CST | Gaining career experience with a HACU paid internship | Register here. This webinar will provide an overview of the HACU National Internship Program and what you need to know about the process, including: Dates of internship sessions and deadlines; Overview of variety of internships available, locations. What you can expect from the application and selection process. Details on stipends, travel, and housing arrangements. Intern evaluation and interview tips. January 18, 2019, 3:00 – 4:00 p.m. CST | Navigating the HACU Online Application | Register here. This webinar will provide an overview of the HACU National Internship Program’s application process and how information provided serves to help match internships with those that best suit your goals, interests, and qualifications. The presenters will provide an overview of the various application sections, including educational background, skills and experiences, work history, and required documents. The webinars will be presented by: Reynaldo Decerega, assistant vice president of HACU National Internship Program and federal relations and Fabiola Yanez, administrative assistant, HACU National Internship Program.